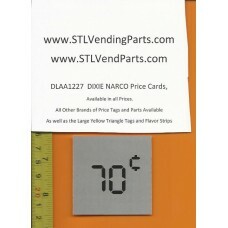 These slide in Price cards are approx 2.35" square. They are NOT Stickers. They have a Silver background with Black numbers. This purchase is for ONE .70 Slide in Price Card. To see a list of other prices in stock and order that price just enter DLAA1227 in the search box at the top of the page. Most Prices are available, just ask in email for other ones if you need one. 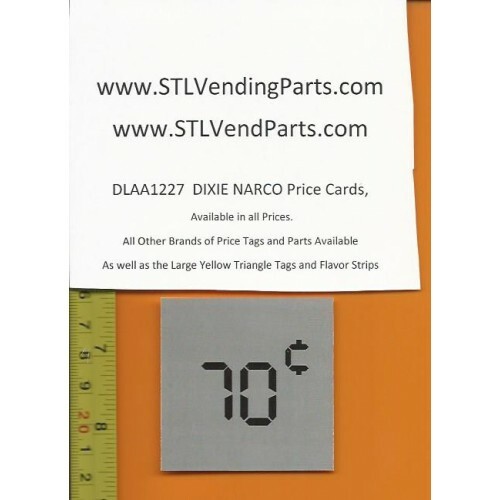 These Labels are for use on the Dixie Narco machines that have a seperate clear square price window (DLAA1119), where the card can slide in from the back side and be seen from the front.